It is a good day for sports-minded Android owners. First, now available in the Android Market is Score Mobile. 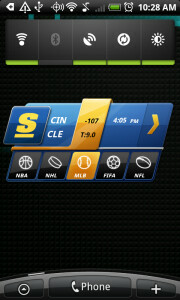 This app gives you the latest scores for Major League Baseball, NFL, NHL and NBA contests. With the latter two leagues in the midst of Conference Finals, this is a great time to install this app. 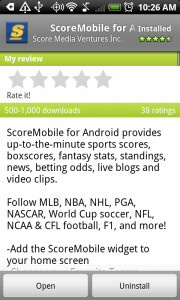 Score Mobile also covers NASCAR, World Cup Soccer, NCAA and Canadian Football. Along with the download comes a nice widget that sports fans might want to make room for on the home screen. The other piece of good news for sports fans with Android is that ESPN ScoreCenter is on the way. ScoreCenter, which claims to track 500 leagues, is already available at the Apple App Store and Playdom, the gang behind the iPhone version, is said to be launching the Android edition by the end of this month. June brings the NBA Finals, the Stanley Cup Finals, hot baseball action and more and it appears that Android owners will be well prepared to follow the action. 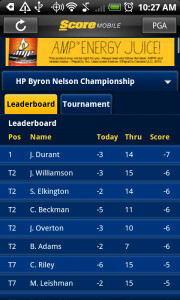 the ESPN app is loooooong over due for the DROID platform, Scoremobile I had with my BB and I thought it was very meh. But this is just another notice to Apple that their exclusivity in their abundance of apps is coming to an end.